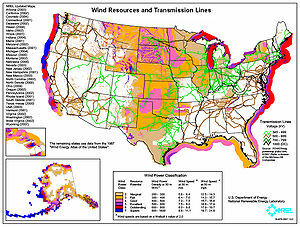 Wind power is reaching the point of being cost-competitive with natural gas for electrical power generation. And with more demand uncertainty for natural gas, and increasing availability and reliability of wind power, utilities are turning more to the use of wind. "Wind's costs have dropped over the past two years, with power purchase agreements being signed in the range of 5 to 6 cents per kilowatt-hour recently." Gas is pretty clean for a fossil fuel. But when it is burned, it is still a carbon that was otherwise locked up for long-term storage that has now been transformed into additional CO2 that has been dumped into the atmosphere. Unfortunately, gas is a more expensive option than coal, so shifting from gas to wind doesn't do as much good as it would if it was helping to displace more coal burning power. It will be beneficial if wind power and other renewables can push the dirtier, more polluting, and environmentally harmful fuels further off the table, but long-range government policy (or the lack thereof) continues to make that difficult. The AWEA has their view: "Now that we're competing with natural gas on cost, we need consistent federal policies to ensure we have a diverse portfolio of energy sources in this country, and don't become over-reliant on one source or another."